Frederick Warburton was born on 26th September 1895 at Place Farm, Bold and christened on 3rd November 1896 in Farnworth. He lived at Place Farm, Warrington Road with his parents, Joseph and Annie and his six sisters and three brothers. On leaving school, most of the children seemed to be working on the farm or in the 12 roomed house. Frederick enlisted into the Kings Own (Royal Lancaster Regiment) 1st Battalion in Rainhill as Private 32793. He died of wounds on 5th May 1918. The Kings Own (Royal Lancaster Regiment) were heavily involved during the Battle of Bapaume which began in April 1917. Frederick was killed 6 months before the end of the war and is buried nearby in Lapugnoy Military Cemetery, VII FII. There is a memorial inscription on his parent’s grave in St Luke’s Church, Farnworth. Medal entitlement: - Victory Medal and British Medal. 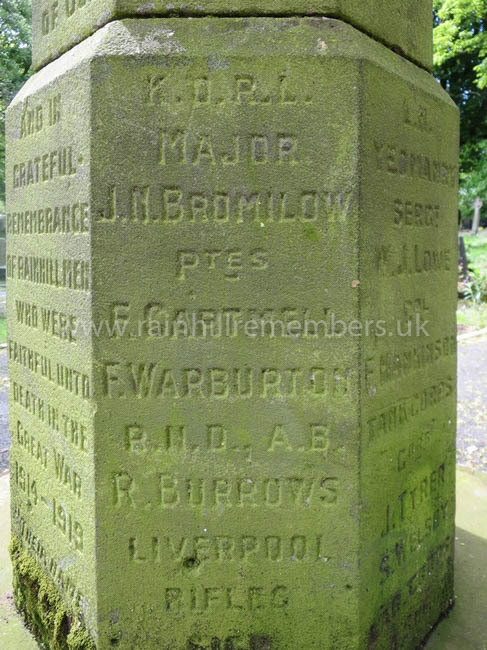 The name of Frederick Warburton of the Kings Own Royal Lancaster Regiment is inscribed on the WWI Memorial in St. Ann's Churchyard.